Last week, NPR's Science Friday had a fascinating segment on bluefin tuna. On the show was Richard Ellis, author of "Tuna: A Love Story." First of all, Tuna can weigh up to up to 1,000. "Chicken of the sea" is a bit misleading. It's more like the cow of the sea. Then again, tuna are predators. So we're not sure what to compare them to. Anyway, when tuna first hatch, they're the size of a grain of rice, so they will increase in size a billion times over their lifetime. Despite their massive size, tuna can move incredibly fast: 50 mph. Part of the reason it can move so fast is how hydrodynamic its body is. And for an extra burst of speed, tuna can basically turn themselves into a torpedo by tucking their fins flush with their body. The Tuna's circulatory system is also a topic of awe for researchers. According to Ellis, tuna are capable of warming their bodies up to 80 degrees (at will) to survive in cold waters. They do so by utilizing a "complex series of countercurrent exchangers in its circulatory system that warm up its muscles." A couple more interesting facts. One, tuna can dive as deep as 6,000 feet. Two, tuna need to be in constant motion or they'll drown. Sharks, despite common knowledge, can stop. Tuna can't. As many creatures on earth, the bluefin is "bordering on extinction," says Ellis. Driven mostly by Japan's tremendous appetite for the fish (bluefin have been auctioned off for as much as $175,00 in Japanese fish markets), fisherman around the world are stripping bluefin tuna stocks to dangerously low levels. What about fish farms? 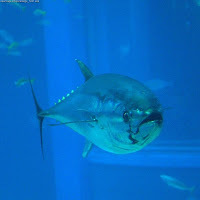 Unfortunately, it's incredibly difficult to breed tuna in captivity. Another notable item from the Science Friday podcast, sushi is a recent "fad" in the Japanese culture dating back to the mid-1900s. Pound360 figured sushi was a Japanese tradition stretching back hundreds of years, but… it's not.